Brief Synopsis – Based on the true story of how a father and son learn to deal with the son’s drug addiction. My Take on it – This is a film that I only heard about recently and the premise itself was quite intriguing that I wanted to see what it was all about. They do a superb job giving the viewer the feeling as of they are right there dealing with the problem of addiction along with the characters the entire way through as they try to find a way to navigate their lives through this very rocky roller coaster that constantly disrupt everything that they know and are familiar with. Love how the story keeps changing directions and you never really know what to expect as things move along. 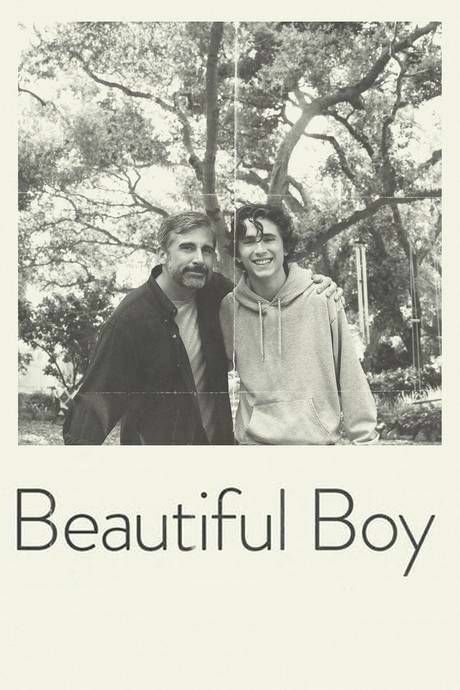 Th actor in this film who has received the most praise is Timothy Chalamet who does a wonderful job showing how the life of an addict can be. He received Golden Globe, BAFTA and SAG nominations for Best Supporting Actor for his performance here yet failed to get one at the Oscars. AS great as he is tho, he is outshone by Steve Carell who once again shows how amazing a dramatic actor he can be and he gives the most powerful performance here and is the most sympathetic and relatable character in this film mainly due to the fact that we can also see his clear vulnerability throughout. Maura Tierney is equally as good as Carell’s wife who must learn to weather it all along with him despite the fact that it constantly adds complications to their family dynamic structure as their lives are disrupted again and again as the addiction of this young man bombards everything they know to be true. Te story is quite powerful and poignant and leaves the viewer with so much to ponder long after the credits role since it comes across as feeling so realistic in the way it deals with this subject matter. Bottom Line – Such an amazing film because it really gives us the feeling of being there with these characters as they try to sort out their problems The story feels like a roller coaster ride and is filled with lots of ups and downs and you never really know where things will lead around each bend. Chalamet has received lots of praise for his work here and even managed to garner a Golden Globe, a SAG and a BAFTA nomination for his performance here but the real standout is Carell who once again proves how amazing a dramatic actor he can be with this very powerful yet vulnerable role. Tierney is also great as his wife who tries to weather this ordeal with him despite the various complications to their family structure and the way that their lives are disrupted again and again by this addiction. Highly Recommended! AGREE WITH YOU ACROSS THE BOARD. Very powerful film. Made my personal Top 25 for 2018. I had not read either book upon which the film is based (one written by the father played by Carrell and the other by the son), I think I knew it was based on the father’s book – so I had no idea where it was going or how things would turn out for the drug addicted son. I was on the edge of my seat right til the end. Agree with you on the performances by Carrell and Chalamet – the latter was absolutely stunning – and his being left out of an Oscar nomination reinforces for me that the Actors Branch – now loaded with newly minted voters who have NO BUSINESS being in the FILM Academy – don’t know what the hell they’re doing. If you’ve seen Beautiful Boy and don’t think Chalamet is one of the BEST supporting turns of the year – you should lose your right to vote. I never say that someone should be IN without saying who I think they should replace – so – IMO – his performance here was better than Sam Elliott or Sam Rockwell. And maybe Adam Driver as well. And I’ve seen them all. I was shocked this movie has been so overlooked at the awards. Completely agree with you about Carrell, he was absolutely brilliant!